- IMPORTANT: This scenario is sequel to "Robin Hood Episode 1/2" scenario. - I suggest playing this scenario after playing the "Robin Hood Episode 1/2" scenario. 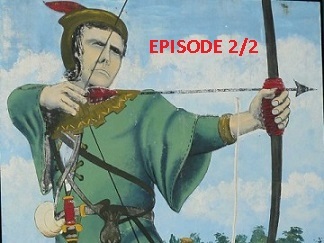 Click HERE to check "Robin Hood Episode 1/2" scenario. - The governor of Nottingham is too angry because Robin Hood organized people to stop sending any natural resources to the attendants of the governor. In fact the governor has too brutal system to exploit people for his benefits. Even sometimes his soldiers kill their own people for their governor. The family of Robin Hood was also slaughtered by soldiers. Robin Hood took a decision to take a heavy revenge from the governor. So Robin Hood created an armed group by persuading people to fight against soldiers and he organized civilians to resist against the system of the governor. Robin Hood is HellKnight61's entry to the 2016 Defend the Spot Competition. The premise of the scenario was rather promising, and a decent cinematic portion introduced the player to the action. However, the playability was greatly hampered by numerous bugs - my hero was often randomly removed, causing an instant loss, and even if that was not the case, I would then encounter a crash near the start of the second wave. Having the player micromanage their archers to continuously snipe off enemies was by no means a poor idea, but I can imagine it getting redundant over several rounds. Furthermore, the quests that the player had to perform between rounds involved an excessive amount of tedium, and as a result actually lasted longer than the action itself. I feel a bit remiss grading the balance purely on the first round of several enemy waves which surely would have increased in difficulty as time went on, so I added on a few points to give the entry the benefit of the doubt. The gameplay boiled down to micromanaging archers around and using them to focus fire down enemy infantry that arrived in single file from a few directions. From what I was able to glean from the instructions, hints, etc there is a good deal of depth to the scenario, but the pacing was a bit off and it was hampered by the aforementioned bugs. This category was generally strong, and the main downside was that the execution of the combination of these spheres with the gameplay left a bit to be desired. While a few fine ideas translated into some nice portions of the map, the design was generally lackluster, particularly due to its fairly regimented and symmetrical nature, which was particularly noticeable given the small size of the map. Terrain mixing and elevation would have made this a more effective map, and in the future it would be prudent to avoid making all regions square and blocky and instead go for a more organic feel. The author did a good job of including useful instructions, and mixed a few novel elements with well-established ones. The player is placed in the shoes of Robin Hood, who is defending a cathedral from the Sheriff's men. However it could benefit from a bit more depth. - My opinion is if the judges can not finish a scenario because of bugs or the difficulty of the scenario they must not review it because they did not finish it... They must not give any points to that scenario. Because the scenario is unfinished so reviewing that unfinished scenario may damage the idea in mind of the author.